The biggest USP of the Captur is in the styling. Renault has rendered it more crossover styling than a traditional boxy SUV. However, the SUV elements are still very much there like flared wheel arches, cladding, faux skid plates and segment best ground clearance of 210 mm. And those 17-inch alloy wheels also scream SUV. Renault has equipped the Captur with LED headlamps and tail-lamps. You also get fog lamps with cornering function and the best in all are the LED DRLs and dynamic swipe indicators (at the front) which Renault likes to call floating indicators. The Captur is also the widest and longest car in its segment but that is more due to redesigned bumpers as the track and wheelbase is identical to that of the Duster. The side profile is highlighted by distinct proportions. The shoulder line rises up as it goes backwards and adds to the style quotient. The rear quarter bears a little similarity to the Kwid but that’s ok since it is part of the same family. Chrome has been generously used all around and Renault will be offering a lot of customisation options on the Captur at the dealership level, something similar to what they are already doing with the Kwid. When it comes to Renault Captur interiors, there is a lot to talk about. It is one of the most attractive and premium-looking car from inside as well. The dashboard layout and design is much better than what is found on the Duster. It looks fresh, decent yet dynamic with butterfly-shaped instrument cluster, large digital speedometer with tachometer and a fuel gauge. The cabin is lighted with ambient LED lights that look really cool and premium. The plastics used are of decent quality. The top-end variant of Renault Captur features a 7-inch touch-screen infotainment system with Bluetooth, Aux-in and USB connectivity options. It also supports voice command, navigation and acts as a rear camera display, when needed. However, it misses Android Auto and Apple CarPlay connectivity. Other features on the inside include steering mounted controls, cruise control, electrically operated wing mirrors and automatic climate control, which is a standard feature acoss all variants. 2017 Renault Captur is quite a comfortable car. The two-tone white-and-black leatherette seats are very comfortable and they look good too. It offers good under-thigh support, knee room, back support and shoulder room, which makes Captur a perfect car for long journeys. Even three average adults on the rear won’t have any complaints regarding space and comfort. The rear gets its own set of AC vents too. 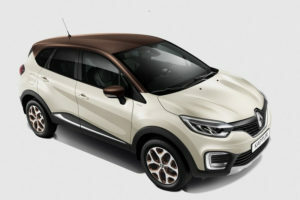 Renault offers the tried-and-tested 1.5-litre H4K petrol mated to a five-speed manual and a 1.5-litre K9K diesel motor with a six-speed manual on the Captur in India for now. On our first drive, we got the diesel version and we were quite impressed with it. This DCi motor makes 110hp and 240Nm like in the more powerful version of the Duster, but refinement levels have really hit a new high. On the Captur, this engine is the quietest it’s ever been. This 1.5 DCi motor has always had a bit of turbo lag and it’s the same story with the Captur. However, once spooled up, power delivery is punchy and the motor pulls strong and smooth almost all the way up to 4,700-4,800rpm. Power doesn’t trail off rapidly like a typical diesel and this makes the Captur rather fun to drive. Of course, if it had delivered 20-30hp more, it would’ve been absolutely perfect. But it’s not that the Captur feels underpowered at speed. With a wide powerband like this, overtaking manoeuvres are a breeze. And combined with the car’s solid stability on wide open roads and fairly high speeds, it has all the makings of a great highway cruiser. Driving the Captur calmly inside the city is something you learn to do. The heavy clutch bites in quite late, and when it does – there’s not much progress from the engine. You will have to go heavy on the throttle, and get the engine ticking over 2000rpm if you want to get anywhere quickly. Below the 2k mark, the Captur feels a bit lacklustre. This means that a quick overtake inside the city, will most definitely require a downshift. When the turbo kicks in, it kicks in with all its might. So, it’s easy to feel overwhelmed trying to ‘control’ the surge. But, drive it around for a while and you’d learn to work around it, and time your overtakes to make use of this wave of torque. Roll on times are quite strong – the Captur does 30-80kmph (in third) in 7.77 seconds, and 40-100kmph (in fourth) takes 11.56 seconds. For reference, an all-out 0-100kmph sprint is dealt with in 13.24 seconds. It could be a lot faster, if the ESP wasn’t as obtrusiveOut on the highway, the Captur is at absolute ease. It’d make for a fantastic road-tripper. Getting to triple digit speeds is a fuss-free affair, and maintaining it easier still. Slot it into sixth, set the cruise control and let it take over. The open highways seem like the Captur’s natural home. It sips consciously here too – the big Renault returned a respectable 21.09kmpl, whereas the figure was a healthy 15.50kmpl inside the city. In terms of kit, the top-of-the-line Platine variant comes well equipped. The infotainment system comes with a touchscreen interface, sat nav and can play music through USB, aux-in or Bluetooth. You also get rain sensing wipers, LED auto headlamps with dynamic turn indicators, climate control, rear parking sensors with reverse camera, keyless-go, leather upholstery and rear AC vents. In terms of safety, we feel Renault should have offered more than two airbags as its rivals offer as many as six in their top variants. In a crowded compact SUV segment, the Captur really stands out for its styling and level of customization. But it’s much more than just a pretty face. A spacious and very practical cabin and boot make it the ideal choice for a family car. And it’s great to drive too. Renault has omitted some of the key features such as the sliding rear bench split seats and automatic transmission that are offered globally. However, the Captur is a well-rounded car and will find a lot of love from those who like to stand apart in the crowd.